Payment Terms: Western Union, bank transfer,T/T, MoneyGram. Clenbuterol has enjoyed a unique place in sports medicine. It is commonly used as a drug to lose body fat and weight while retaining muscle mass and body strength gains. It is also used by athletes who are diagnosed with exercise-induced pulmonary hemorrhage (EIPH). Clenbuterol is generally used by athletes, alone in a Clenbuterol only cycle. It may be used in conjunction with anabolic androgenic steroids and performance enhancing drugs for reducing body fat and promoting the growth of skeletal muscle. It is widely believed that Clenbuterol has the ability to increase muscle mass by enhancing protein synthesis. Clen is one of the best cutting cycle drugs to increase the core temperature and metabolism of the body that proves beneficial in burning of calories. One of the biggest advantages of Clenbuterol is that it can dramatically reduce abdominal and visceral fat, which makes it an excellent choice for cutting cycles. In addition to this, Clen may also be used to aid in recovery when used as a post cycle therapy drug immediately after the end or towards the end of a steroid cycle. This celebrity diet secret, described as a wonder drug as a route to size zero, is even admired for its ability to help athletes maintain strength and intensity during strenuous workouts. Clenbuterol also has the potential of promoting significant and sustaining improvements in the levels of oxygen transportation in the body and aerobic capacity. It can even stimulate the central nervous system and target beta-2 receptors that promote stimulation of muscle growth and improving protein storage in muscles. 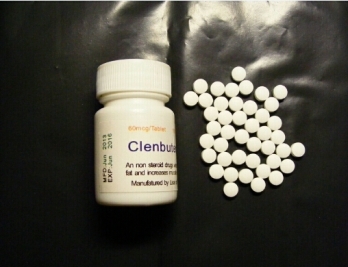 Clenbuterol is as popular among women as it is with men. This is because the repartitioning effects of Clenbuterol are not associated with androgenic side effects such as thickening of the skin, deepening of the voice, and facial hair. Men may use this drug in a Clenbuterol only cycle at dosages of 60-140 mcg per day (60mcg, 80mcg, 100mcg, 120mcg, 140mcg, 120mcg, 100mcg, 80mcg, and 60mcg) and female athletes may use this drug in a Clenbuterol only cycle at dosages of 40-120 mcg per day (40mcg, 60mcg, 80mcg, 100mcg, 120mcg, 100mcg, 80mcg, 60mcg, and 40mcg). Clenbuterol is ideally used in a 2-day on and 2-day off or 3-week on and 3-week off cycle. A big majority of athletes take 200-400 mg of potassium tablets or 3-4 bananas while being on a Clenbuterol only cycle as this drug may deplete natural potassium in the body in some cases. This weight loss drug is generally used with T3 and athletes are advised to follow a high protein (1.5g per lb of bodyweight), moderate carbohydrate (0.5g to 1g per lb of bodyweight), and low fat (0.25g per lb of bodyweight) diet. Clenbuterol should not be used by pregnant or breastfeeding women or those who may get pregnant while using it. It is not recommended for purposes other than medicinal. Use of this drug is not advised to children and those allergic to Clenbuterol or any of its ingredients. Clen is also not advised to those diagnosed with health conditions such as coronary artery disease, congestive heart failure, prostatic hypertrophy, urinary retention, glaucoma, hyperthyroidism, tachycardia, tachyarrhythmia, heart or thyroid diseases, high blood pressure, ischemic heart disease, myocardial infarction, and hypertrophic obstructive cardiomyopathy. Clenbuterol abuse or overdosing may lead to side effects that are usually temporary and subside quickly. Side effects associated with abuse of Clenbuterol include muscle cramps, excessive sweating, heartburn, face flushes, headaches, anxiety, or restlessness.